BOIL water in large saucepan. POUR pasta and salt in boiling water. Cook for 6 minutes and drain. 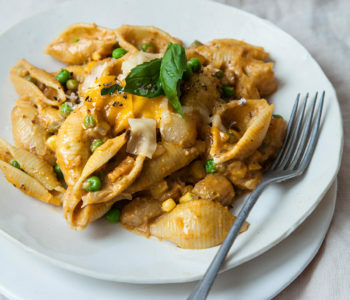 Reserve pasta. HEAT olive oil on medium heat in same saucepan. SAUTE onion and pepper for 5 minutes. 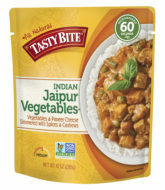 ADD corn, peas, milk, and Tasty Bite® Jaipur Vegetables™ and cook for 5 additoinal minutes. 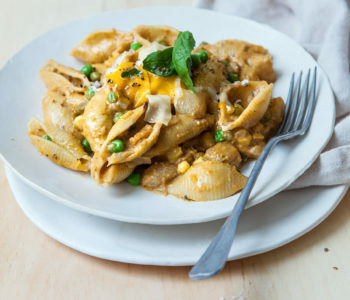 ADD cooked shells and 2 cups of cheese to pan. Heat until cheese is melted. SERVE immediately and top with remaining cheese. Enjoy!